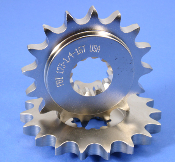 174- 530 chain offset sprocket options - Suzuki GSXR 1000 2009 - 2012, GSX 1300R 2008- 2012. GSX-R1000R 2017 - 2018, 530 Chain. Note: the stock part numbers that these offset may work with or have the same shaft fitment will be listed as options at the top of the part page of the part you are searching for per your year and model. These Offset parts may not have the spline width as the stock part and may require a spacer if needed. 1/4" 0.250in. or 6.35mm offset, 3/8" 0.375 or 9.53mm.